Clinical records of adult patients with medically refractory epilepsy visited at our center for preoperative assessment were reviewed. Candidacy for surgery depended upon the decision of the multidisciplinary Committee of the Epilepsy Unit. The location of the presurgical EZ was determined by consensus during patient management meetings. Patients underwent comprehensive presurgical assessment which consisted of evaluation of a detailed clinical history and neurological examination, complete neuropsychological evaluation, psychiatric assessment, interictal, and ictal onset patterns in long-term scalp video-electroencephalogram (video-EEG), MRI, subtraction ictal-interictal single-photon emission computed tomography (SPECT) coregistered with MRI (SISCOM) and PET results. Invasive intracranial monitoring with subdural electrodes was performed when the standard presurgical evaluation failed to localize the EZ or when functional mapping of eloquent areas was needed. Histopathological findings and at least 1-year of follow-up after surgery according to Engel’s classification scale were recorded. For inclusion in the study, a good to excellent post-operative outcome (Englel scale I-II) was required. Two experienced nuclear medicine physicians, who had no knowledge of the patients’ clinical data, independently evaluated the PET studies and provided a presurgical EZ (hemispheric and sublobar location) for each set of PET imaging modalities (visual interpretation, SPM, and PET-analysis) obtained per patient. Processed PET images where corregistered with MRI following the same transformation and an automatic anatomic labeling template was used to determine the location of hypometabolic areas, represented as clusters (16). 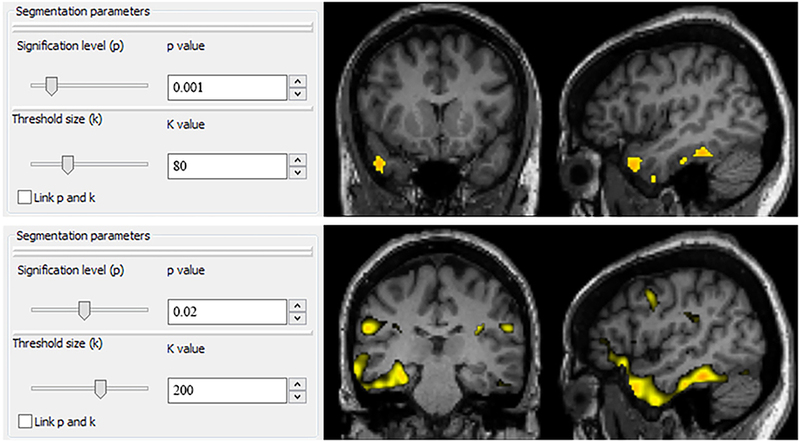 PET studies in which a hypometabolic area within the cerebral cortex was observed by visual interpretation or a cluster after SPM and PET-analysis processing were labeled as “positive studies.” When a unique cluster appeared after the analysis with SPM and PET-analysis, this area was defined as the presurgical EZ. When more than one cluster appeared after image processing, the definition of the presurgical EZ was based on both the statistical significance and the cluster size; the biggest cluster and with the highest statistical significance was considered as the presurgical EZ. Areas of decreased metabolism located outside the cerebral cortex or at the interhemispheric region were excluded. Any discrepancy in observer assessment was resolved by consensus. The presurgical EZ with side and sublobar concordance with the post-surgically confirmed EZ were considered as “correctly localizing studies.” The observers also recorded for each patient evaluation the number of clusters which were present in SPM and PET-analysis and the level of confidence with which the presurgical EZ for each study (high, medium or low confidence) was assigned. 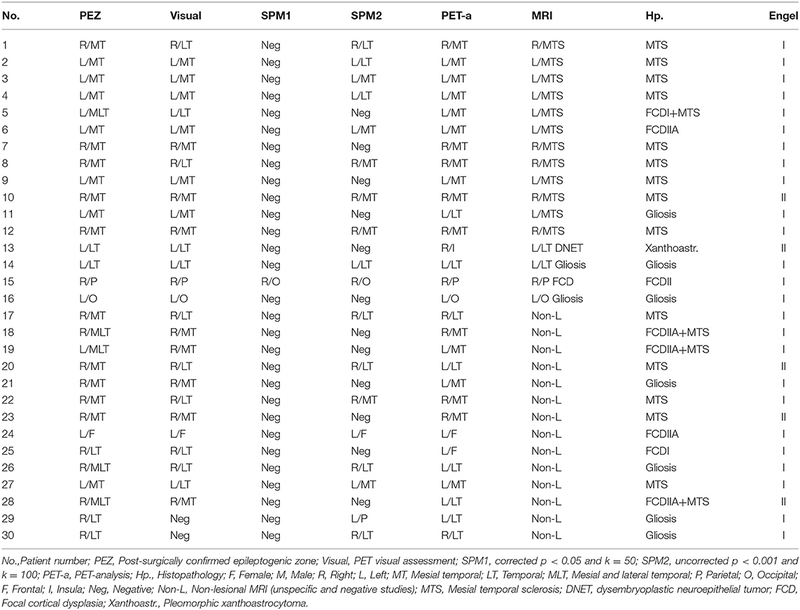 The proportion of positive and correctly localizing studies by visual assessment and after SPM and PET-analysis processing was compared with the McNemar’s test. 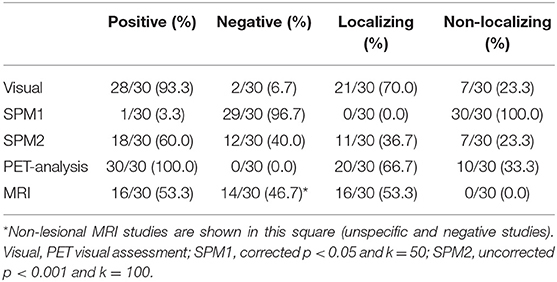 The proportion of positive and correctly localizing studies by MRI were also calculated. The concordance between the presurgical EZ according to the different techniques and the post-surgical EZ was evaluated using the kappa index (κ) and its 95% confidence interval (CI95%). This concordance was considered as slight with κ > 0 and ≤0.20, fair with κ > 0.21 and κ ≤ 0.40, moderate with κ > 0.41 and κ ≤ 0.60, substantial with κ > 0.61 and κ ≤ 0.80, and excellent with κ > 0.81. The mean value of the clusters obtained with SPM and PET-analysis was assessed. The proportion of correctly localizing PET studies was compared with the number of clusters and the level of confidence using the Chi2 test. The number of clusters and the level of confidence were compared with the analysis of variance (ANOVA). Differences were considered to be significant with a p < 0.05. Statistical analysis was performed with MedCalc Statistical Software version 16.2.1. This work was supported by Agència de Gestió d’Ajuts Universitaris i de Recerca [AGAUR 2014 SGR 279] and by Biomedical Research Networking Center in Bioengineering, Biomaterials and Nanomedicine [CIBER-BBN – MITP2 Intramural Project]. The funding sources had no role in study design, data collection, analysis or interpretation, decision to publish, or preparation of the manuscript.